your feet - we seldom consider how vital it is to keep them limber and healthy until they give out on us; and then we realize just how powerless we are without them. And while we all don't have the time or resources to devote to trips to the nail salon or spa to keep our feet as relaxed as possible, that doesn't mean we can't treat our tootsies to a little TLC each night before bed in order to keep them in tip-top (or is that tip-toe) shape for the next day. A quick, simple massage can be performed in a matter of minutes by simply rubbing the undersides of each toe in succession, and also working your fingers on the tops of your feet and the balls. According to NutriLover, this massage will have a marvelous effect on a number of interrelated systems in your body including increasing your rate of metabolism, increasing the level of oxygen in the tissue, amplifying the strength and elasticity of your skin, and improving your blood circulation. In addition, the massage can benefit muscles which become both stronger and more relaxed as they stretch and shrink in tune with the massaging actions. It's also good to remember how many nerve endings live inside our feet. 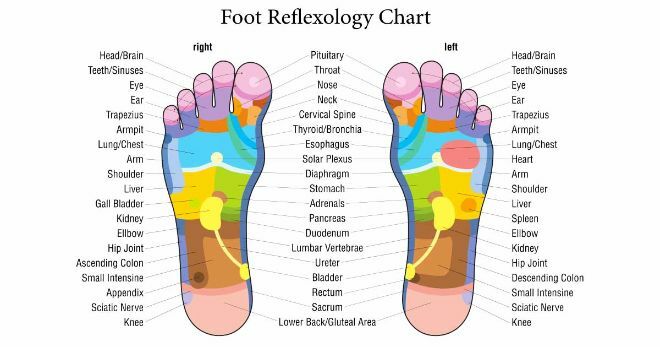 By applying a 10-to-15 minute massage at the end of each day, according to a report by Time For Natural Healthcare, we can actually heal our feet from the ravages of day-to-day living.